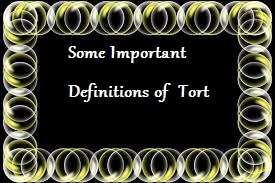 Home » Law of Tort » Some Important Definitions of "Tort"
"Tort is civil wrong, for which remedy is a common law action for unliquidated damages, and which is not exclusivel breach of contract or breach of trust, or other merely equitable obligations". "Tort is civil wrong, independent of breach of contact for which the appropriate remedy is an action for unliquidated damages".
" Tortous liability arise from the breach of a duty primarily fixed by law; this duty is towards persons generally and its breach is redressible by an action for unliquidated damages "
"A tort is a civil wrong for which the remedy is a common law action for unliquidated damages , and which is not exclusively the breach of a contract or breach of trust or other merely equitable obligation." A) it maybe an act which, without lawful justification or excuse, is intended by the agent to cause harm,and does cause the harm complained of. B) it may be an act in itself contrary to law, or an commission of specific legal duty,which cause harm not intended by the person so acting or omitting. C) It may be an act violating an absolute rights (especially rights of possession or property) , and treated as wrongful without regard to the actors intention or knowledge. This, as we have seen, is an artificial extension of the general conceptions which are common to English and Roman law. E) it may, in special cases, consist merely in not avoiding or preventing harm which the party was bound. Absolutely or within limits to avoid or prevent.